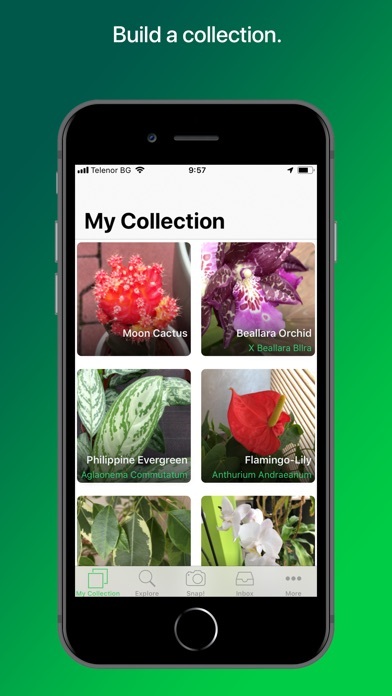 Instantly identify plants of all kinds: flowers, trees, succulents, mushrooms, cacti and more! PlantSnap is the revolutionary plant identification app from Earth.com built to help you instantly identify plants in a snap. 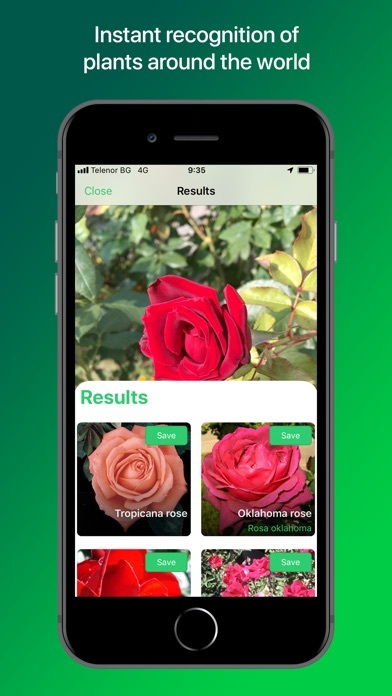 Users on iOS12 can experience instant plant recognition, no framing or snapping required! Simply tap a detected plant on your device for information on the plant in a real-time Augmented Reality view. PlantSnap now works in every country on Earth and is translated into 30 languages! Our database has been upgraded to over 500,000 species, and the algorithm is now 94% accurate. Have you ever been on a hike, vacation or simply on an afternoon walk and wondered what species that plant, flower or tree was? Take a picture of the plant and PlantSnap will tell you what it is in seconds using its robust plant database. With Plantsnap, you can reconnect to the natural world around you and learn about nearby plants, or browse our gallery to discover new and exotic plants all across the globe. Plantsnap also comes with a map of plants nearby to help you get out and explore. Whether you find peace and mindfulness from hiking, or if you are interested in studying nature, Plantsnap has the resources and technology you need. PlantSnap also comes paired with a seamlessly integrated companion website, allowing you to upload photos from your computer for instant identification or check items from your plant collection. PlantSnap is powered by deep learning and artificial intelligence, meaning that it actually learns and improves with every image you feed it. Every image you take makes PlantSnap better and adds to the growing Plant Database. Get out there and start PlantSnapping! PlantSnap Features: Identify Plants with Your Camera • Instantly learn the name of plants, flowers and trees with a picture! • Open the PlantSnap app, snap a photo, and watch the PlantSnap Database name the plant in seconds. Auto-Detect Plants to Identify • PlantSnap automatically tells you when a plant is framed well • Tap the screen where the flower is highlighted for the most accurate results Augmented Reality Plant Identification (requires iOS12) • Watch amazing Augmented Reality animations over a plant • View information on a plant through an AR interface Plant Database • Our database is global and our results are instantaneous. 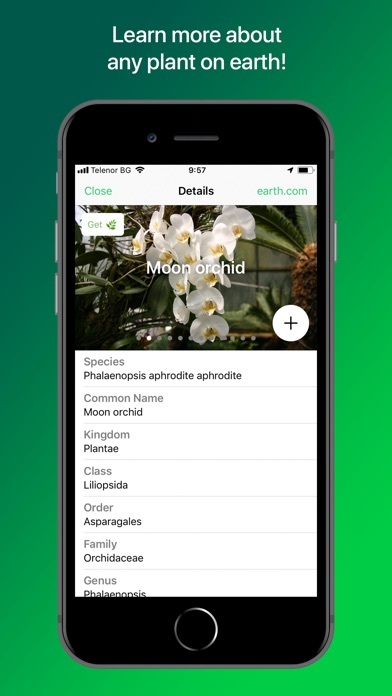 There are currently 585,000 plant species in our worldwide database • PlantSnap currently has 90% of all known plant species on Earth in our database, and we continue to train more species into our algorithm every month. Plant Identification & Learning Algorithms • Our algorithm is retrained and improved every month using the 200,000+ anonymous images taken by our users every day • PlantSnap will update automatically for you every time we add a new batch of species, no additional fees required Companion Website • Visit my.plantsnap.com with your PlantSnap account • View your collection from the app on the web • Add photos to identify from your desktop, then keep track of things on your mobile Discover the World Around You • Use the Explore section to view every anonymous photo taken with the PlantSnap app anywhere on the entire planet • Gamify your hikes with friends and family! 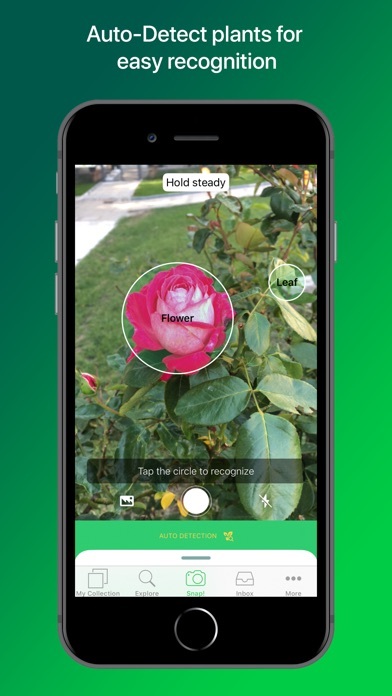 Plantsnap lets you build a library of every plant, tree or flower you've snapped. See how many you can collect! • Get some fresh air and improve your mood! Plantsnap connects the divide between technology and nature. Download PlantSnap now and start PlantSnapping! **Be sure to watch our instructional video to get the most accurate results! ** **Please check your email after purchasing for more detailed information. ** We are looking to make Plantsnap better all the time. Please leave your feedback in the app to help Plantsnap grow! Love the concept, look, and framework. But the database needs work! Maybe it’s just because it’s early Spring, but if I had accepted the suggestions I would have been wrong at least half the time. Even misidentified poison ivy. Developers, how can we help? A decent app, and not always right. Quite annoying when it’s wrong ( which is most of the time) truth be honest I don’t like it. I’ve tried numerous times to identify a number of plant - all to no avail! It’s even given the same picture numerous identifications! Bummer. It won’t even let you send without a star! Will not let me save a single plant after it identifies it. Always says error... try again later. Why bother! After taking pictures of several house plants it was only able to correctly identify 1 out of 4. More and more I’m finding this misses the mark. How does one add to the master database? This App gets the plant incorrect about 1/3 of the time. I often have to make several attempts at Photo analysis to get the correct plant. Only had this app for a couple hours and it has identified almost every plant in my yard. I’m sure they won’t identify everything but it is awesome!